One of football's best-known adages -- so known that it has essentially become cliche at this point -- is that every inch counts. No matter where you are on the field, every last square inch on the gridiron is crucial. It doesn't take a prolific genius to figure that it especially holds true when defending in goal-line situations. Just a few mere yards are the ultimate difference between six points. As the Pittsburgh Steelers were moving the ball at the end of the first half, they found themselves with a 1st-and-10 just one yard away from the end zone. They trailed, 17-6, and a touchdown would have brought them within one possession -- not to mention the momentum surge that they would have taken into halftime. Though they were missing the electric Le'Veon Bell, they still had the ever-capable DeAngelo Williams. And yet, they were stuffed. Williams could get absolutely nowhere, and Ben Roethlisberger could not connect with Eli Rogers. The Steelers settled with a chip-shot field goal -- still bringing them within a possession, but not quite as momentous as a touchdown would have been. "I got a good jump," Valentine said. "I had a free run-in, and I ended up making the play." "It was luck of the draw, effort and finish," said Alan Branch, who had dodged a lineman diving at his feet to stay only a step or two behind Valentine in the Steelers' backfield. "All of that happened to go our way." One play later -- an incomplete Ben Roethlisberger pass aimed at wide receiver Eli Rogers -- the Steelers settled for a field goal. Instead of a momentum-building touchdown for Pittsburgh, the Patriots handed the Steelers a momentum-squelching whiff on what turned out to be their last best opportunity to stay in the game. They never again threatened. "It's tough to stop a team from getting one yard anywhere on the field," Branch said. "To do that to stop them from scoring, it was a good win." Valentine was hardly alone in the Steelers' backfield on the play. Branch, Trey Flowers and Jabaal Sheard all followed closely behind him. It was that swarming effort up front -- aided by the Steelers' loss of Le'Veon Bell to a groin injury in the first quarter -- that helped the Patriots limit Pittsburgh to just 54 rushing yards in the game, their lowest total since mid-November. The Pats effectively were able to put the game away in the third, thanks to a field goal from Stephen Gostkowski and touchdowns from LeGarrette Blount (on the goal line, no less) and Julian Edelman. 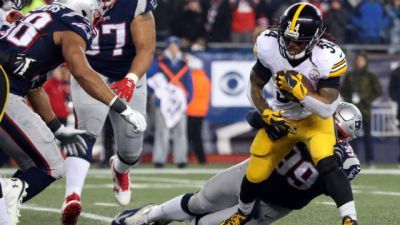 Though Cobi Hamilton hit paydirt for the Steelers late in the fourth, it was too little, too late, and the Patriots were able to punch their ticket to their seventh Super Bowl since 2001 -- all thanks to that steady goal-line effort. The goal-line stop just before halftime was the pinnacle of the Patriots' defensive effort -- and the turning point in the game that sent them to the Super Bowl. "It was a momentum swing," defensive end Chris Long said. "From there we never looked back." "You come in with the mentality that you don't want to let them score," Valentine said, "and you're definitely not going to let them run in there."